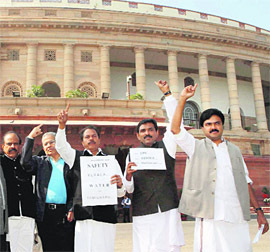 As a united Opposition continued to pile pressure on the UPA government on its decision to allow foreign investment in multi-brand retail trade and paralysed Parliament for the seventh day in succession, harried Congress leaders were working hard to win over its allies, particularly Trinamool Congress chief and West Bengal CM Mamata Banerjee, to shore up its numbers in case of a vote on the FDI policy in the Lok Sabha. The Centre today strongly repudiated in the Supreme Court the allegation of Gujarat’s former Home Minister Amit Shah that the CBI had framed him in the Sohrabuddin encounter case as part of a conspiracy to destabilise the Narendra Modi government. The Central Administrative Tribunal, hearing the petition challenging appointment of Director, PGI, Chandigarh, Dr Yogesh Chawla, today declined to give the Centre any further chances to file replies and said it would start hearing arguments now. About 70 per cent of the electorate cast their ballot in Bellary (rural) bypoll in Karnataka where the ruling BJP is locked in a bitter contest with its former leader B Sreeramulu who is seeking re-election as an independent. An Election Commission official said that polling was peaceful. On the eve of World AIDS Day, UNAIDS has cautioned the government against complacency on the HIV/AIDS front and recommended generous investment in the sector for sustenance of gains. The final meeting of the Parliamentary Standing Committee scrutinising the controversial Lokpal Bill ended without a consensus on existing contentious issues, most significantly the inclusion of Prime Minister under the anti-corruption ombudsman’s ambit. One person was killed and at least three others were injured when unidentified militants triggered off a blast just outside the venue of Sangai Festival in Imphal East district this morning. The festival came to an end this afternoon. With the standoff between Kerala and Tamil Nadu on the Mullaperiyar dam issue escalating, Kerala Chief Minister Oommen Chandy will meet Prime Minister Manmohan Singh tomorrow. Claiming that the PM was "already convinced" of the state's demand for a new dam in place of the 116-year-old structure, Chandy said after a Cabinet meeting that he would once again take up the matter with him. The mortal remains of Jnanpith awardee and peace broker Dr Indira (Mamoni) Raisom Goswami were consigned to the flames at a crematorium in her home city this noon in presence of a large gathering of fans, friends, well-wishers and dignitaries. She died after a prolonged illness in a hospital here on Tuesday at the age of 69. The Associated Chambers of Commerce and Industry of India (ASSOCHAM) has proposed a 15-point agenda for inclusion in the proposed manifestos of various political parties. hief Minister Mayawati’s plans at image building ahead of the Assembly poll received another setback today with the state Lokayukta Justice NK Mehrotra recommending the removal of Minister of State for Sports Ayodhya Prasad Pal on charges of corruption. Finance Minister Pranab Mukherjee is learnt to have called senior BJP leader LK Advani tonight and offered a one-line adjournment motion for a debate on the FDI policy. Advani rejected the government’s offer as he was not in agreement with the content of the motion. While the Opposition motion calls upon government to withdraw its policy, the motion proposed by ruling coalition seeks a discussion on the “situation arising out of the decision to allow 51 per cent foreign investment in multi-brand retail”. Unsure about its numbers, Congress does not want a motion which is critical of the government. Congress president Sonia Gandhi, Prime Minister Manmohan Singh, Pranab Mukherjee and other senior leaders spent the best part of the day in internal deliberations. The Congress core group first met in the morning and went into a huddle again this evening. The Congress top brass is faced with the onerous task of persuading its allies, who have opposed opening up of the retail trade while dealing with a determined Opposition. It has also to allay the fears of its own members to put up a spirited defence of its policy. The party’s options are limited as the Congress leadership has said it will not backtrack on its policy. “The PM had made it clear that it is a well thought out decision and the party supports it,” Congress spokesperson Manish Tewari declared at this evening’s press briefing. Having rejected the demand to roll back its FDI policy, the government may be forced to accept the opposition’s second condition that this issue be debated in Parliament through an adjournment motion which entails a vote. Before moving ahead in this direction, the government has to make sure that its key allies, the Trinamool Congress and the DMK, are firmly on its side. The Prime Minister spoke to Trinamool Congress minister Sudeep Bandhopadhya and DMK leaders in Delhi for their support in case the matter is put to vote. While the DMK has said it will not pull down the government, Mamata Banerjee has not given any firm assurance in this regard. It is imperative for the government to win over its allies and other supporting parties if it is to defeat the Opposition’s adjournment motion. It will be a huge embarrassment for the government if its allies vote against its motion. It will be under greater pressure to roll back its FDI policy in case of a defeat. The government is also keen that the adjournment motion, which is the basis of a debate in the Lok Sabha, does not contain any element of censure. Although the government is not expected to call it quits if it loses the vote in an adjournment motion, its position stands to be weakened. This week’s formal run ends tomorrow with Friday being the Private Members’ Day. Then Parliament resumes its normal business sitting only on December 7, with Parliament closed on Monday and Tuesday for Moharram. “The theory of conspiracy is a self-serving smoke screen” of Shah aimed at subverting the course of justice, Additional Solicitor General Indira Jaisingh told a Bench comprising Justices Aftab Alam and Ranjana Desai. The Bench is hearing the CBI’s plea for shifting the trial of Shah and the other accused outside Gujarat and for cancelling bail granted to the former minister, a close aide of Modi. Simultaneously, the Bench is also hearing Shah’s plea for recalling the Supreme Court’s January 12, 2010 order asking the CBI to conduct a fresh probe, despite the fact the state police had already filed a chargesheet in which he was not an accused. It was the probe by a Special Investigation Team that had brought out the fact that Sohrabuddin Sheikh, his wife Kauserbi and associate Tulsiram Prajapathi were killed by senior police officials of the state in fake encounters. It was the state police that was part of the SIT and not the CBI and as such there was no question of the CBI fabricating a case at the instance of the Centre, the ASG said. The ASG also sought initiation of contempt proceedings against Shah and his lawyers for alleging that Supreme Court Judge Tarun Chatterjee (since retired) had ordered the CBI probe despite he himself being under the CBI scanner in the PF scam in the Uttar Pradesh judiciary. The allegation had been made merely on the basis of a news report, which was not admissible in a court of law, she contended. Sohrabuddin was killed on November 26, 2005, Kauserbi on November 29, 2005 and Prajapathi on December 26, 2006. During this period, Amit Shah was holding the portfolios of Home, Law and other departments. As Home Minister, he was responsible for maintaining law and order, while as Law Minister his job was to ensure proper prosecution of the accused. So, his plea for recall of the Supreme Court order for a CBI probe was not in public interest, the Centre contended. Justice VK Bali of Central Administrative Tribunal (CAT), while hearing petitioner Digamber Behera, who has questioned the procedures followed by the Centre in appointing the PGI Director and alleged several irregularities, has fixed December 12 as the date for arguments. The judge said enough chances had been afforded to the Centre - both the Ministry of Health and Family Welfare and the Department of Personnel and Training - to file their replies. Even on the last date of hearing here, the respondents had failed to submit their replies and CAT had given them one last chance to file the same today. It clarified that it would grant no further adjournments. Meanwhile, PGI Director Dr Chawla, appearing through his counsel, said today that he would file his reply in the matter, wherein the petitioner has questioned constitution of the selection committee for the PGI Director’s appointment. The committee, he has alleged, delegated its powers to a sub-committee of experts who were not authorised to conduct interviews of applicants for the post. Two of the four members of the sub-committee were either lower in scale or on a par with the scale of the incumbent to the PGI Director’s post. DoPT rules prescribe that selection panel members have to be at least of the same scale or that higher than the person they are to select. The petitioner also placed before the court today the list of marks which 19 applicants to the post were given by the sub-committee of experts who conducted the interviews. The Tribune had reported the list in its columns and questioned the manner which the committee had adopted in arriving at the final marks for various candidates for the post. Dr Yogesh Chawla had received the highest marks - 85, in the interview conducted in April this year. The mark list revealed that there were five finalists in the following order of merit - Yogesh Chawla (85 marks), Amod Gupta, PGI (82 marks); Vinod Paul, AIIMS (79 marks), Digamber Behera, PGI (75 marks) and Raj Bahadur, Government Medical College, Sector-32, Chandigarh (75 marks). In the final panel which the Health Ministry sent to the Appointments Committee of Cabinet (ACC) for approval, three names were forwarded. Curiously, the name of Dr Paul was dropped even though he stood third in the merit list. Dr Bahadur was instead brought in alongside Chawla and Gupta. Behera was also dropped. It is worthwhile to mention here that for the first time in the history of selection of the PGI Director, the institute body of the PGI did not finalise one name for recommendation to the ACC and instead authorised the health minister to send a panel. The institute body had met in the Health Ministry headquarters in Nirman Bhavan here after the shortlist of candidates was finalised in April this year. The meeting ended without any consensus. It was reported to be very stormy. Its minutes have not been sent to the institute body members to date. With 133 polling booths identified as hypersensitive and 52 sensitive out of the total 195, the Assembly segment was thrown a thick security blanket with the deployment of some 2,500 personnel, including Central paramilitary force, civil police and home guards. Sreeramulu, a former Health Minister, quit the seat after being indicted in the Lokayukta report on illegal mining, and parted ways with the BJP by contesting as an independent. Kolkata: More than 40 per cent votes were cast till late afternoon Wednesday in the by-poll to the Lok Sabha from Kolkata South constituency here. Polling was slow but peaceful, and was held under tight security. Around 20,000 security personnel have been deployed for the by-poll, officials said. 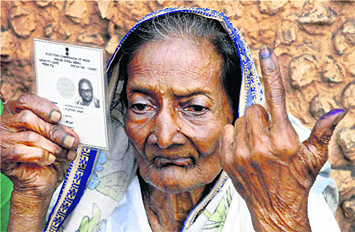 “Around 43 per cent people have voted till 3 p.m.,” said an election department official. The constituency, which has elected West Bengal CM Mamata Banerjee to the Lok Sabha half a dozen times in a row, is all set to see a first-time MP. Ranchi: The bypoll for Mandu Assembly seat in Jharkhand was passed off peacefully, registering 61 per cent polling. "The polling passed off peacefully," Hazaribagh Deputy Commissioner Manish Ranjan told PTI. The polling, which began at 7 am ended at 3 pm, held amidst helicopter surveillance and tight security with 32 companies of security personnel overseeing free and fair polling. Speaking to The Tribune today, UNAIDS Country Coordinator Charles Gilks said India had made incredible progress in reducing the rate of new HIV infections by half and putting more people on life-saving treatment, but it needed to invest more to sustain those gains. “The sting in the tale is that if money is not spent, gains will be lost very quickly. New infections will shoot up and the epidemic will return with a vengeance,” Gilks cautioned today. Between 2000 and 2010, India reduced its new HIV infections by 50 per cent. In the National AIDS Control Programme-III, it also exceeded the five-year target on persons to be put on anti-retroviral treatment. Over 4 lakh Indians are now on treatment. But even today, India has 2.5 million HIV positive people - 49 per cent of the HIV population of Asia which had about 4.8 million people living with HIVs at the end of 2010. This was 11 per cent more than the 4.2 million it had in 2001. In India, the challenge is the funding, considering that global donors are backing out in the light of the economic meltdown. Currently, only 25 per cent of India’s entire HIV/AIDS budget is domestic. The rest comes from global agencies like the World Bank, DFID, Bill and Melinda Gates Foundation etc. Several global donors have indicated cut backs in AIDS budgets. Gilks today warned, “The challenge is for the (next) 12th Five-Year Plan to ensure enough domestic funding to sustain the progress made. To sustain 50 per cent drop in new infections over another decade will cost more and not less. “That is a difficult message to convey to politicians. The issue now will be to make sure that the Ministry of Health proposes the right kind of budget for the HIV/AIDS sector in the 12th Plan and the government votes for it,” Gilks said. UNAIDS today called on the government to fast track the pending HIV/AIDS Bill, saying core groups which are at high risk would require legislative protection to secure their human rights once the funding shrinks. “There are concerns around the Bill, but there is no concern that can’t be resolved,” Gilks said. The panel remained sharply divided on party lines with several members, including those from BJP, disagreeing with various aspects like bringing the PM under the purview of the anti-corruption watchdog. If the Bill is drafted as per Congress members’ recommendations, the PM will be kept out of the Lokpal’s ambit. BJP members wanted inclusion of the PM in the purview of the Lokpal, with some safeguards, and the Citizens’ Charter to be a part of the institution. Samajwadi Party’s main demand was to make the Citizen’s Charter a part of the Lokpal. BSP, on the other hand, recommended exclusion of the PM from the ambit of the Lokpal, but wanted the judiciary to be brought under it. While the committee was racing against time for the Bill to be tabled during the winter session, the report will now be sent to the government along with dissent notes of members who have divergent views on different issues. Incidentally, LJP chief Ram Vilas Paswan kept his threat of boycotting the last meeting to finalise the draft legislation. Objecting to the “report being silent on assuring reservation to backward classes, minorities and women in the anti-graft body”, he also targeted Team Anna for its “false promises” on the issue. 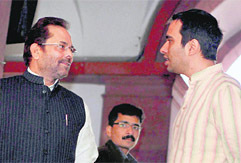 “Team Anna has shown its apathy towards backward classes who have been the biggest victims of corruption,” he said. 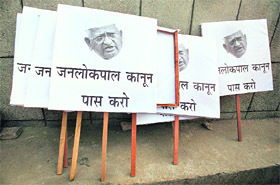 Meanwhile, going by the way the situation is unfolding, it will be very difficult for the government to avoid another round of confrontation with Anna on the streets of Delhi, unless, as a senior Congress leader said, the draft Bill is “honest enough to convince people of its genuineness”. The police suspect that the explosive device was planted in a rickshaw. The rickshaw puller later died in hospital. 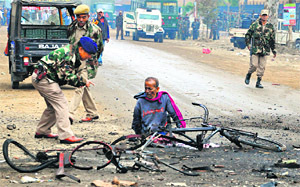 No militant outfit has so far claimed responsibility for the blast that took place just three days before Prime Minister Dr Manmohan Singh is slated to visit Imphal (December 3). He is scheduled to launch and inaugurate several development projects. The PM is also expected to address a public meeting. The site of the blast is close to a convention centre which the Prime Minister is slated to inaugurate. Police officers suspect that militants of the Kangleipak Communist Party (KCP) were behind the blast. The 72-hour general strike in Manipur, called by a faction of the militant outfit KCP, is slated to end at 6 am on Thursday. The KCP, one of several separatist groups in Manipur, is said to have been involved in a series of deadly explosions and attacks on security forces in the past. The bandh call was given to protest the prolonged economic blockade on national highways connecting the state. However, the United Naga Council (UNC) had withdrawn its blockade from Monday. More than 20 militant groups are active in Manipur, bordering Myanmar, with demands ranging from secession to greater autonomy for the state. With the standoff between Kerala and Tamil Nadu on the Mullaperiyar dam issue escalating, Kerala Chief Minister Oommen Chandy will meet Prime Minister Manmohan Singh tomorrow. Claiming that the PM was "already convinced" of the state's demand for a new dam in place of the 116-year-old structure, Chandy said after a Cabinet meeting that he would once again take up the matter with him. Chandy said he would write to Tamil Nadu Chief Minister Jayalalithaa explaining Kerala's position on the Mullaperiyar issue. He sought to know why Jayalalithaa, who was opposing the Koodankulam Nuclear Power Project in Tamil Nadu on the safety issue, was reluctant to adopt the same yardstick in the Mullaperiyar issue where the safety of three million people was involved. "The Tamil Nadu Chief Minister has been opposing the Koodankulam project on the ground of the safety of the people. Is not the issue of safety applicable in the case of people in Kerala also?" he asked. Expressing his readiness to meet his Tamil Nadu counterpart to discuss the issue, he said, "I am ready to take the initiative to meet Jayalalithaa, if that will find a solution". Kerala Cabinet, which discussed the Mullaperiyar issue, resolved to stick to the state's demand for building a new dam and reduce the water level at the reservoir to 120 feet from the present level. Chennai: Tamil Nadu Chief Minister J. Jayalalithaa has urged Prime Minister Manmohan Singh to advise the Kerala government not to precipitate the Mullaperiyar Dam issue any further. In a letter to the PM, released to the media here, Jayalalithaa said: "I once again reiterate that the retrofitted Mullaiperiyar Dam is safe and is functioning as good as new," the letter states. State honour was accorded to the departed litterateur, one of the most prolific in contemporary world of literature, at the funeral with a 21-gun salute being provided by Assam Police personnel. The chamber has undertaken the first exercise of its kind with a view to generate public opinion to achieve double-digit growth during the coming decade. Assocham national secretary general DS Rawat released a document “Assocham suggestion for election manifesto of political parties in Uttar Pradesh” which would be shared in the coming days with political parties, MLAs, MLCs and MPs through workshops. According to Rawat food processing, automobile, textiles, leather, cement, healthcare, pharmaceuticals, information technology, real estate and tourism were the significant areas that could transform the state’s economy. This has come two days after the Lokayukta Justice Mehrotra recommended the removal of the fifth minister there. Mayawati has already sacked four tainted ministers - Rajesh Tripathi, Awadhpal Singh, Badshah Singh and Rangnath Mishra - on the recommendation of the Lokayukta.